Group of nurses and firefighters with the donated fire engines. Photo courtesy of Fire District 7. By Heather Chadwick, Snohomish County Fire District 7Public Information Officer. Over the last year, several members of Snohomish County Fire District 7 have worked with Melissa Bear, a Washington State Council of Firefighters Burn Foundation Representative, to visit the Burn Center at Harborview Medical Center. During their visits the firefighters have brought pizza for the nurses, administration staff, patients and their families. They have played with the patients and have also built teddy bears and delivered them to children, and a few adults, who are going through burn or trauma injury treatments. “The firefighters who have visited the Burn Center all come away wanting to visit again,” says Evan Adolf, a Battalion Chief with Snohomish County Fire District 7. BC Adolf, who leads Fire District 7’s Honor Guard, coordinates the visits with Melissa Bear. At one of the recent visits a group of Fire District 7’s Probationary Firefighters noticed that the children had push cars to play with on the floor. These cars give children going through treatment the opportunity to just be kids for a while. The Burn Center had a taxi cab and a police car for the kids to play with, but no fire engines. The group of probationary firefighters decided that wasn’t good enough for the kids and took it upon themselves to pool together their own funds to purchase a fire engine for the children. 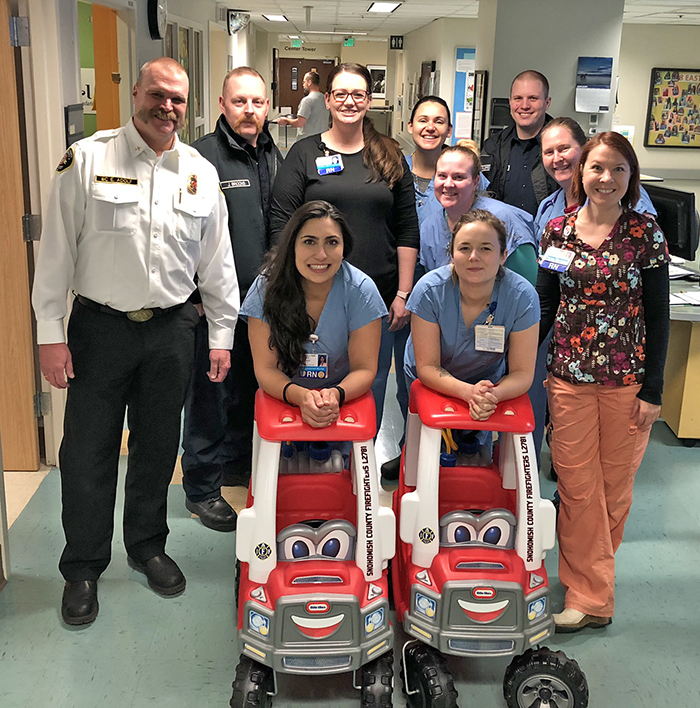 On Thursday, January 17, 2019, they made a special delivery to floor eight at the Burn Center at Harborview Medical Center. They pooled together enough money to purchase not one, but two fire engines for the kids. “Every kid needs a fire truck to play with,” said Probationary Firefighter Johnson Brooks. Our fire district members plan to keep visiting the Burn Center at Harborview Medical Center. It allows firefighters to recognize the impact of their rigorous training and how it enables them to save lives in hazardous conditions. But more importantly, it is an opportunity to support the patients and their families while they are going through treatment. Driver/Operator Matt Suhayda plays with a burn center patient. Photo courtesy of Fire District 7.